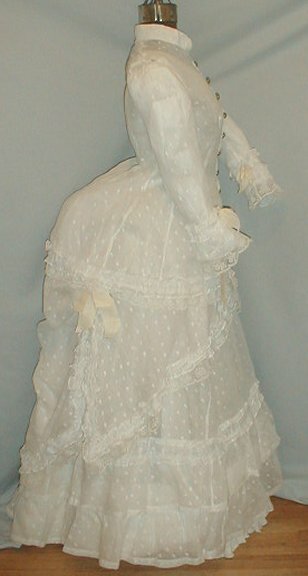 An exquisite 1870’s three piece embroidered muslin bustle wedding dress. 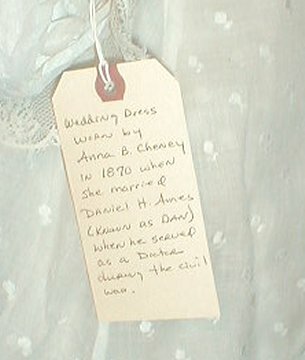 The dress was worn by Anna B. Cheney from Carlisle, PA. When she married Daniel H. Ames. He served as a doctor during the Civil War. A tag is attached to the bodice with all this information. The muslin fabric has a small embroidered floral pattern. The hemline on the hip length bodice is trimmed with Val lace. The sleeve cuffs are trimmed with lace and ivory sulk ribbon bows. The bodice has a front button closure and is unlined. The overskirt has a draped front panel and draped bustle back. 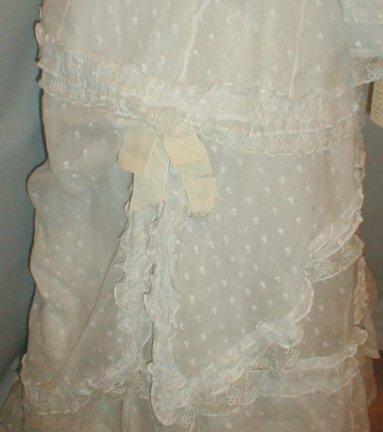 It is unlined and trimmed with Val lace and ribbons. 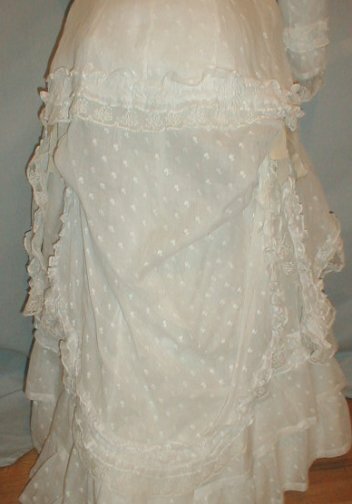 The underskirt has a trained back and double ruffle at the hemline. It is unlined except for a wide band of cotton at the edge of the hemline. The dress is in crisp and clean condition. There is no age discoloration or spotting. The bodice has a couple of tiny repairs near the buttons. A beautiful display gown with great documentation. Bust 34 Waist 26 Front length of underskirt 37 Back length 44. I'm a little hesitant about that note attached to the dress. If this was worn in 1870, technically speaking, I should put it in the 1860s category (there was no year zero. The zero was invented later.) 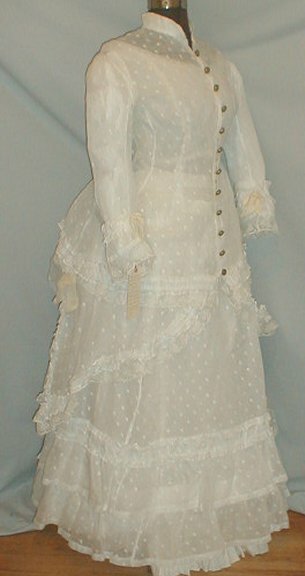 However, the styling of the dress would indicate a date later than 1870 as well (maybe she remade it later?). It's an interesting dress and I adore the frothiness of it.